Chettinad Chicken Curry or Chicken Chettinad is a popular Spicy Chicken Kulambu from the Chettinadu region of Tamilnadu in South India. All Chettinad style preparations have aromatic gravy, made with freshly ground Masala and uses a variety of spices. The perfect blend of spices and herbs gives Chettinad Chicken Kulambu its well-balanced flavours. The cuisine of Chettiars is renowned for its signature dishes like Chettinad Chicken, Chettinad Meen Kuzhambu, Nandu Masala (Crab), Era Varuval (Prawns curry) etc. 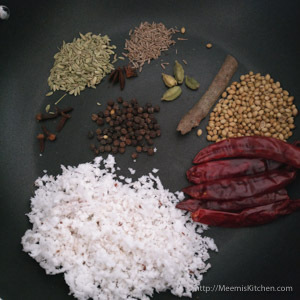 The traditional Chettinad style dishes are made with hand pound masalas. I am always fascinated by the spicy flavourful masalas; In India there is no dearth of cuisines. The spices used are different from region to region. I love exploring and experimenting on various cuisines in India. Too many and too good! For foreigners, everything is just Indian Curry; but the vibrant cuisines and tastes are definitely worth exploring and relishing! Check my Chicken Masala Roast, a fusion of South and North Indian cuisine. This Chettinad style Chicken curry (South Indian chicken curry) is rich in flavours- the roasted masalas, the aroma, the vibrant taste everything about this Chicken chettinad is enchanting! Do try these variety dishes of India like Kashmiri Mutton Curry, Punjabi Chicken Curry, Goan Fish Caldine, Andhra Spicy Prawns Masala, Thalassery Mutton Biriyani, Thalassery Chicken Biriyani, Chicken Liver curry, Butter chicken, Paneer dishes from various regions, Pav Bhaji, Aloo Paratha, Chole Bhature, Spicy Alleppey Fish curry, Kottayam fish curry, Tangy fish curry, Kuttanadan Duck Roast, Traditional Butter Murukku, Kadachakka Mappas, Banana fritters etc. Phew! I can go on and on about the tasty dishes, you will never get tired of the rich, delicious flavors. Another chicken dish that is a must try is Peshawari Chcken curry, a delicacy that is quite simple to prepare. Chettinad Chicken curry is served with rice and veggies or with Ghee rice, Vellayappams, Idiyappams, Neer Dosa, Kallappam or Appams. It is not a very complicated dish as you imagined it to be; roasting of Masalas and coconut takes very little time and usually the chicken is pressure cooked to induce the strong flavors. 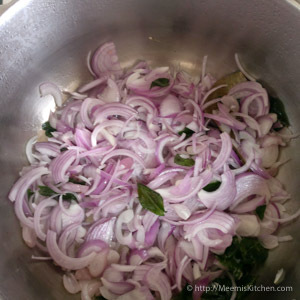 Small onions or Pearl Onions are used to give that authentic Chicken Chettinad taste. 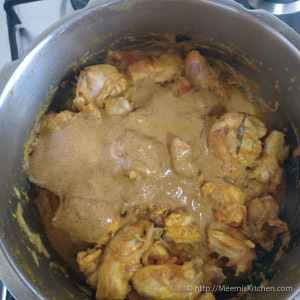 So here is the succulent recipe for Chettinad Chicken Curry! Enjoy! Cashew nuts : 12 – 15 nos. Clean and drain the chicken pieces. Marinate with salt, Kashmiri Chili Powder, Turmeric Powder and curd or lime juice for half an hour to one hour. Meanwhile, heat a pan and roast Coriander seeds, pepper corns, Red chilies, Cardamom, Cinnamon, Cloves, Fennel seeds, Cumin, Star anise along with scraped coconut till medium brown. 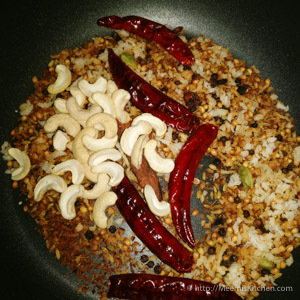 Add cashewnuts (You can add 1 tsp Poppy seeds/ Khus Khus instead of cashews) and roast for another two – three minutes. Grind the spice mix to a grainy powder and add ¼ cup of water and grind to make fine paste. Keep aside. In a pressure cooker, pour 1 ½ tbsp. 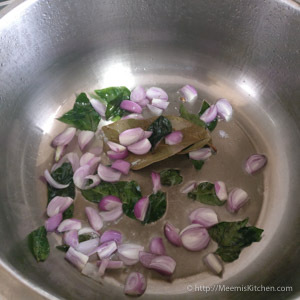 oil, add Bay leaf, then curry leaves, followed by sliced small/ Pearl onion. 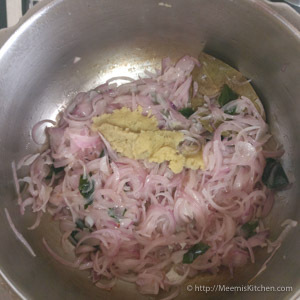 Sauté till small onions are slightly transparent and add sliced Onions and fry till translucent. Add Ginger garlic paste. 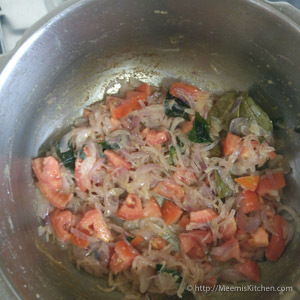 Fry for some time and add Chopped Tomatoes and turmeric powder. Fry till they are mashed well. To this, add marinated chicken and combine well. Keep on high flame, stirring occasionally till water oozes out of the chicken. 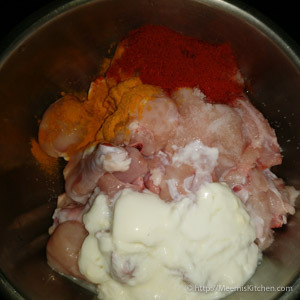 Pour the masala paste to the chicken and mix well. 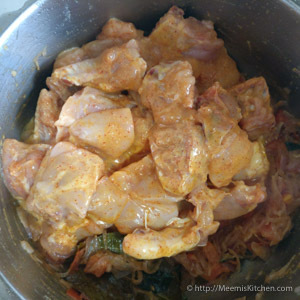 The masala should coat the Chicken pieces. Adjust the salt and cover and cook till one whistle. 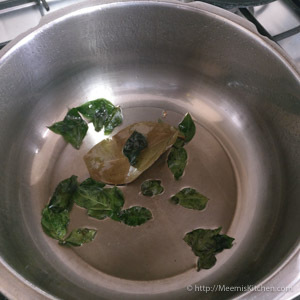 Wait till the pressure is released, adjust the seasoning and add fresh curry leaves. Transfer to a serving plate and garnish with Coriander leaves. Your spicy Chettinad Chicken Masala is ready. Adjust the chilies and other spices according to your spice tolerance level. You can use sunflower oil or sesame oil for this recipe. I have used Sun Flower oil. You can marinate the chicken pieces with Lime juice instead of curd. Curd makes the chicken more tender. If you want more gravy, add ¼ cup of water while cooking. The water from the chicken is enough to cook the chicken and gives semi dry gravy. Pressure cook for just one whistle if the chicken is tender. 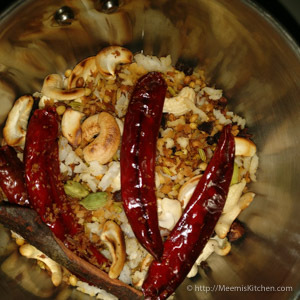 You can also prepare this in a wide Kadai. Stir occasionally to avoid sticking / burning. Instead of Cashew nuts, use Poppy seeds (1 tsp – 1 ½ tsp) to get a thick paste. Coriander leaves are used for garnish. Serve it with rice, Idiyappams, Appams or rotis. 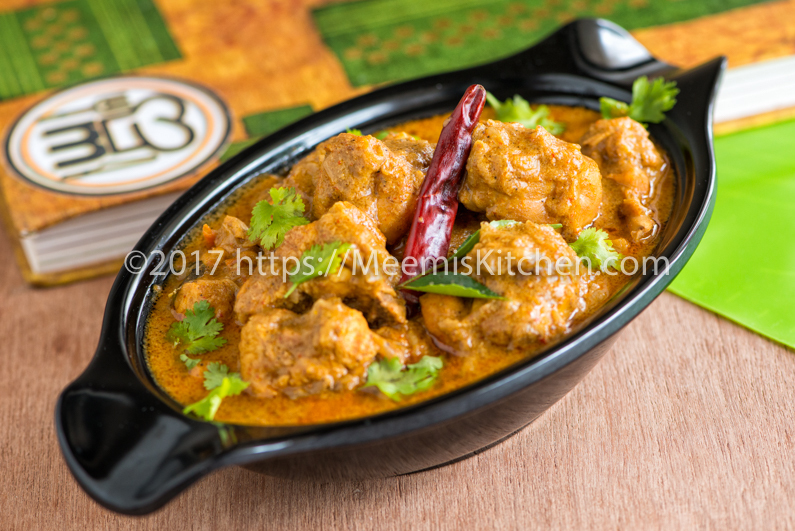 If you like this Chettinad Chicken Curry recipe, share with your friends using the share buttons on the side or put in your comments. I will be happy to see your comments. God Bless!! Thanks Teny for your lovely comments. Really happy to know that. You may also like Punjabi Chicken curry. Thank you Rosy for your positive comment. It sure is encouraging and exciting to know that someone tried my recipe and is quite happy with the results. Thank you for your sweet comment and please do try other recipes.